She couldn’t envision being where she needed to be in the center of the deck to ensure successful navigation on the river, and also being where she needed to be on the bridge to monitor other conditions while maneuvering near the smaller boat. So she changed plans. They decided that the smaller boat would come to meet them in the harbor instead. 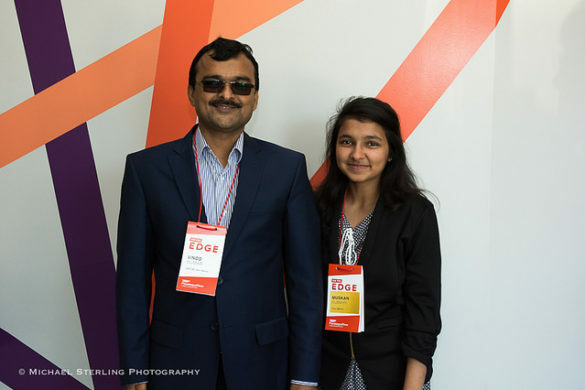 With the mantra, “Series, not parallel” (meaning that they would focus on micro-goals, or a series of smaller events that needed to happen to ensure success) as their guide, she and her crew successfully boarded the officials and their families. This four-step practice, summarized as: Breathe, Vision, Mantra, Begin, is simpler and, in a way, more zen-like than what you (or at least, I) might expect from the Navy SEALS. Proof that leaders of all kinds still need to return to these fundamentals in stressful situations. 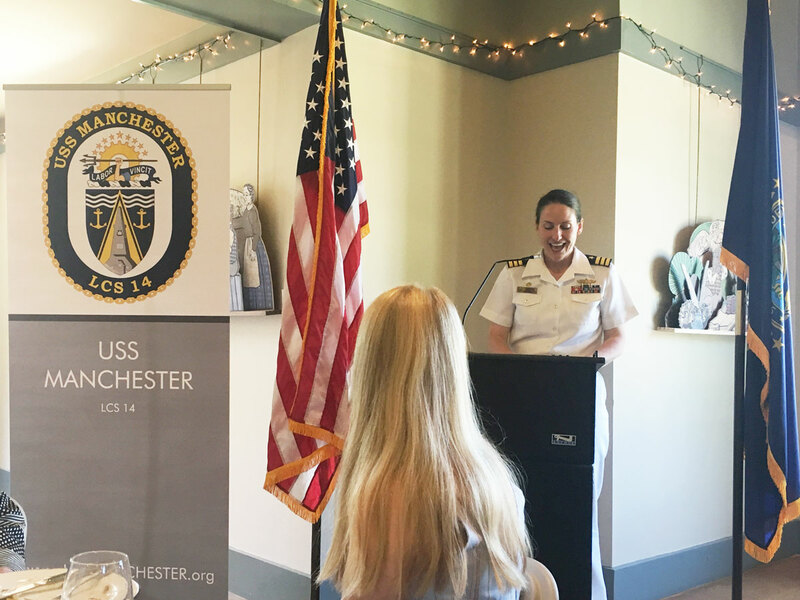 Commander Bassett also talked about how micro-goals in conjunction with a “begin” mentality can break down seemingly overwhelming endeavors into manageable steps. As someone who has accomplished as much as she has, and who now commands this Independence-class littoral combat ship, Commander Bassett is certainly a credible source of advice for folks under pressure. 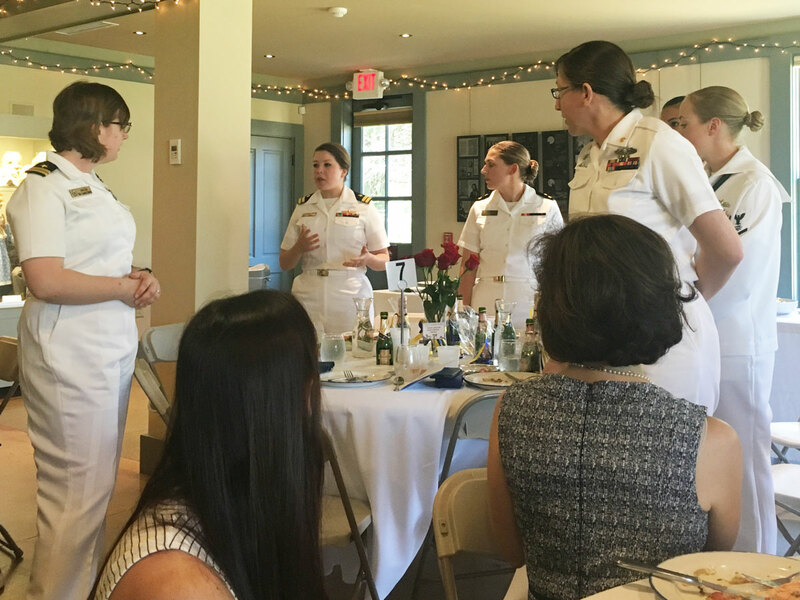 We also got to meet six key crew members of the USS Manchester, including two New Hampshire natives — a Nashua, NH native who is the ship’s navigator, and a Derry, NH native who is one of the ship’s IT specialists. Manchester Joyce Craig also addressed the crowd, with a message specifically for the younger women in the crowd. She talked about her early career in advertising and biotech, and how she never would have thought at that age that she would run for office some day. Keep your mind open to bigger things, she said. She talked about running successfully first for School Board and then for several terms as Alderman in Manchester, before losing her first run for mayor by 64 votes, out of over 20,000 votes. Her commitment to her city’s need for new leadership that collaborated with the community is what drove her to stay involved after such a devastating defeat. She ran again two years later — successfully, this time — becoming the first woman mayor of the City of Manchester. The event was sponsored by Moet Hennessy, who has a kickass woman winemaker at Moet-Chandon, Pauline Lhote, just named Wine Mag’s 40 under 40 Tastemaker. They donated a small bottle of Chandon to each attendee, and encouraged us to take them with us and toast to our community’s women leaders. Another event sponsor, Stephanie Seacord of Leading Edge Marketing, encouraged us all to take home one of the roses from our table centerpieces and let them carry on the magic of the event. I gifted my rose to a barista named Maggie after the event — so, it worked! — as a result of this seemingly small event detail, I was able to connect with another local woman leader after the event. As someone who organizes many events, including some specifically designed to get women to connect with each other, I was really impressed and energized by this event. Thanks to the Chamber Collaborative of Greater Portsmouth, Strawbery Banke and everyone else involved in making this happen. Looking forward to the commissioning of the USS Manchester this Saturday in Portsmouth! Great article, Crystal! Thanks for describing what was obviously an inspiring event. We are fortunate to have so many great women role models willing to share their experiences while mentoring others!! Thank you, Sue! We are fortunate, indeed.